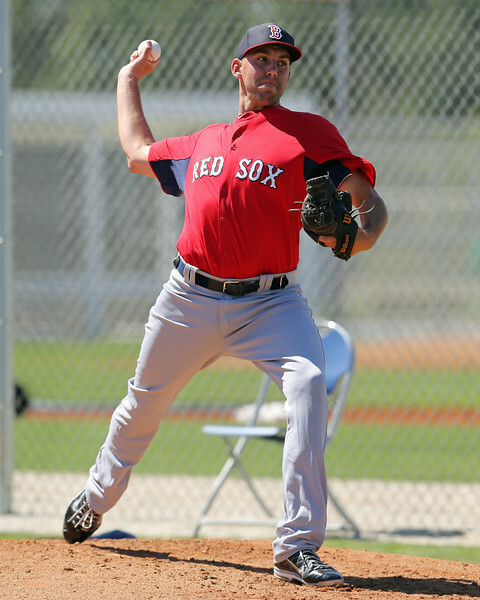 In this edition of The Write-Up, Chaz Fiorino provides a detailed scouting look at SoxProspects #9 prospect, Matt Barnes. Stat line – 3 1/3 IP, 6 H, 4 ER, 3 BB, 2 K; 83-46 Pitches-Strikes. Physical Description – Athletic, strong, durable frame. Long legs, high waist. Not much room for physical growth. Arm/Delivery Mechanics – Three-quarters arm slot. Long in back with wrist curl. Works from middle of rubber with hands set at the chest. Fluid delivery. Great balance over rubber on back leg generating power. High leg kick with average extension towards the plate. Struggled with release point and repeating delivery this outing, pulling off his front side. Comments: Sat 93-94. Occasional arm-side run when down. Jumps on hitters. Tendency to leave up in zone. Legitimate swing-and-miss fastball. Needs to command better down in zone. Future average command. Comments: Late, tight downer when on top. Inconsistent, struggled to command for strikes. Consistently buried down out of zone. Comments: Fade away from left-handed hitters. Flat up in zone. A little firm. Thrown with great arm speed. Comments: Struggled with release point. Consistently behind in counts. Eight of 19 first pitch strikes. Comments: Focused. Composed. Didn’t let tough outing affect emotions on mound. Summation: Making 13th-career Triple-A start, Barnes featured a three-pitch mix with future average command. He showed a repeatable, fluid delivery with easy arm strength. He showed potential to be a future major league number three starter with improved development of secondary offerings and command. This was a tough outing for Barnes who battled issues with his command and delivery over his 3 1/3 innings pitched. He was consistently out of sync with his upper half and pulling off his front side causing command issues. It’s a fluid, easy delivery that he probably controls more effectively than was on display in this particular outing. He walked three batters and was consistently pitching from behind in counts. In the third inning, he made a mistake pitch on a 3-1 fastball middle-up that was taken for a home run to right field. He was forced to challenge with fastballs over the plate as he fell behind in counts often. Barnes struck out two, both on fastballs up in the zone. In total, he generated 10 swing and misses, 9 with the fastball, 1 with the change-up. The fastball is his best offering, sitting 93-94. It’s a legitimate plus fastball generating swing and misses. It jumps on hitters and showed arm-side run when he was able to keep it down in the zone, but he struggled to do so in this outing. He consistently missed up and paid for it. He tried to establish the curveball early rather than pounding the zone with his fastball and trusting his best offering. The curveball showed the most potential of his secondary offerings this outing. He tried to establish the curveball early, throwing a plentiful amount in the 78-82 mph range. At it’s best, it showed late, tight downer action with depth. He consistently buried it down out of the zone, but was unable to throw for strikes. To the hitter’s credit, they did a great job laying off his curveball, which was made easier by often being ahead in counts. The pitch flashed future above-average potential with improved command. The changeup was his third-best offering this outing. He only threw a handful and generated one out of his 10 swing and misses with the pitch. Thrown with solid arm speed showing average fade away from left-handed hitters. A little firm at 84-87 but just enough separation from fastball velocity at 93-94. Showed future average potential with improved confidence and ability to throw for strikes. The key for Barnes to reach his full potential will be to control the delivery and avoid consistently pulling off his front side. With a potential three average-plus pitch mix with average command, Barnes should be a quality middle-to-back end type starter. The continued development and trust in his secondaries will also be a large factor to complement his plus fastball. I’d like to see Barnes establish the fastball early and command his secondaries for strikes in future outings. It was great learning experience outing for Barnes and will be interesting to see how he responds next time out. To his credit, he showed great poise and continued to battle despite the frustrating results. Chaz Fiorino is a Northeast Scout for SoxProspects.com. He is a graduate of the MLB Scout Development Program. Follow him on Twitter @cbfiorino.